Is it possible to write poetry with a toddler? I love the idea that people can play with language at any age. In fact, my little girl is doing it every day as she experiments with sounds and new words. But writing poetry? Well, it’s worth a try! My daughter loves nursery rhymes. We’re forever singing ‘Baa Baa Black Sheep’, ‘Row, Row, Row Your Boat’ and other favourites. So I wondered what would happen if we took the lyrics to a few different rhymes and mixed them up. 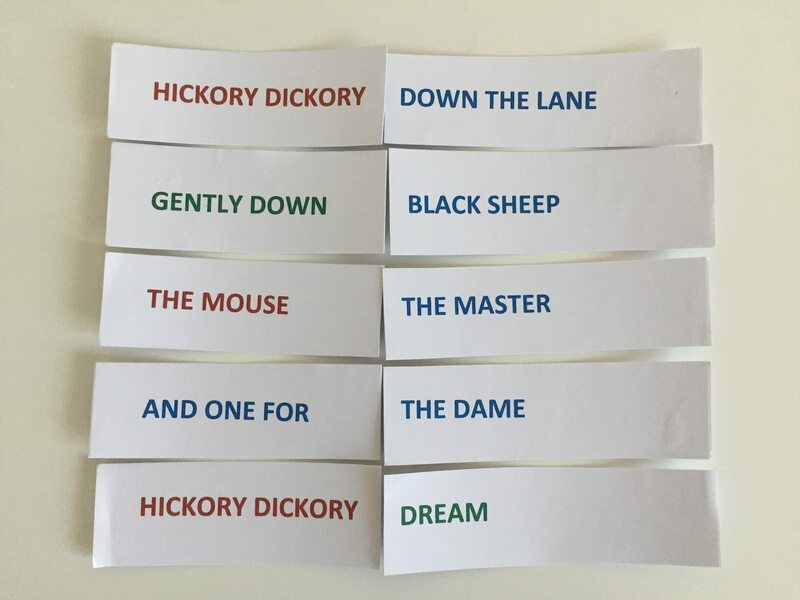 I printed out the words to ‘Baa Baa Black Sheep’, ‘Row, Row, Row Your Boat’ and ‘Hickory Dickory Dock’, stuck them onto some card and chopped them into sections. 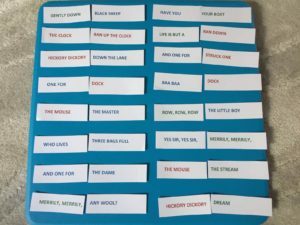 This gave me thirty two small cards – each with part of a nursery rhyme on them. The game was ready. 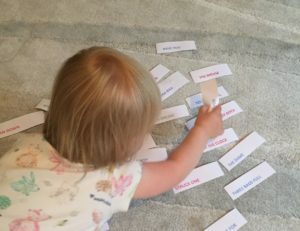 My little one isn’t quite old enough to actively pick out words based on their meaning or sound so we had to take a ‘lucky dip’ approach. Then we muddled our way through a game where we took cards from each pile and paired them up at random. This involved quite a bit of singing and some lengthy breaks as my girl got distracted. But finally, when both piles had been used up, I laid out the pairs and read through the new lines we’d created. Some of the lines didn’t quite seem to work. But there were others that sounded as though they could be part of a new rhyme. They were quirky or had a nice ring to them. So I played with these until they were in an order that felt right. Our rhyme was complete. A curious mix! Just one of the many variations that the cards could have given us. When we play the game again we’ll get a new mix of lines and a whole new rhyme. I’m intrigued to see what it will be. But I might wait until my girl is a little older… then she can fully enjoy the line-matching silliness with me! My favourite line is the clock ran up the clock and hickory dickory dream. One to try with my little ones! Hickory dickory dream is one of my favourites too!